The MILLHOG® Air Powered Saw has a 5” cutting depth and mounts onto a WrapTrack® System which clamps around the pile circumference. 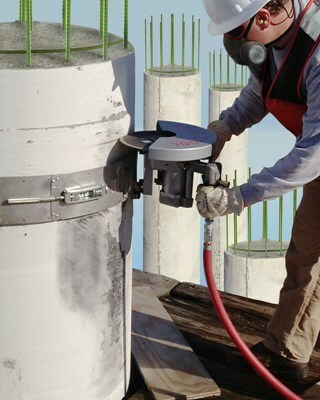 The MILLHOG® Air Powered Saw for trimming concrete pilings features a 14" fiberglass reinforced blade that has a 5" cutting depth and mounts onto a WrapTrack® System which clamps around the pile circumference. Providing a trolley that mounts onto the track and supports the saw as it smoothly glides around on V-grooved stainless steel wheels, the operator score cuts around the piling to achieve a clean, square cut before trimming. An efficient method for preparing piles for trimming without damaging the reinforcing bars, the WrapTrack® System has stainless steel bands and is offered in 28 sizes to fit piles from 6" to 60" dia. The 3-HP MILLHOG® Air Powered Saw operates on 90 psi shop air @ 80 CFM and has a safety relief valve that prevents running at excessive speed. The MILLHOG® Air Powered Saw and WrapTrack® System is priced from $5,895.00, depending upon the band size.